September is the January of fashion. But instead of making resolutions that we often ditch, we start to update our style. Magazines (specifically, American Vogue) weigh the same amount as a newborn baby, and the stars who grace the covers are meant to entice us and have us pull out our wallet. September is also the time when we used to go back to school. While those days may be behind us, it's still when we revamp our wardrobe and prepare for fall. It's like a mid-year rebirth for your closet, if you will. 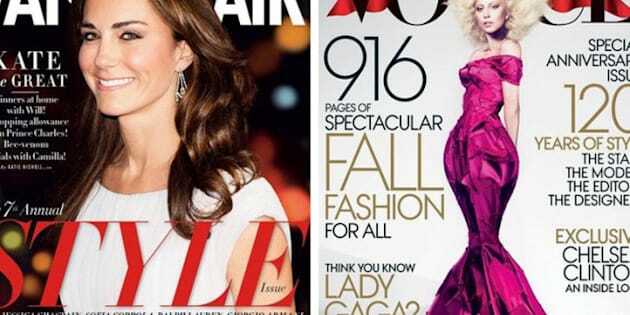 This year, the covers are showing celebrities like Lady Gaga on Vogue to a stock image of Kate Middleton on Vanity Fair, trying to draw us in and make us read 900 pages about fall and everything we need to have a fashionable season. Editorials are more lavish than other months, ads are tripled and inspiration is more abundant than ever. So as we prepare to start seeing these magazines hit the newsstands, for now we'll settle for looking at the covers and weighing out our options as to which glossy deserves our hard-earned dollars.